It would be verging on insanity for us to pretend to be experts in any of the ventures we’re undertaking here on the Homestead. Basically, we get by on a combination of nuggets of information gleaned from Suzie and Belinda (The Farmer’s mentors), half remembered observations, a variety of e-newsletters, library books and magazines, frantic google searches and, when all else fails, gut feeling. Some days when the sun is shining, the animals content, and the garden a flourishing Eden, we sit on the deck with coffee in hand and congratulate each other on maybe having this all sussed. Other days, we blunder from one disaster to the next and send embarrassed apologies to where ever it is that Opa (who made his living from his garden) is now Resting in Peace. There was a definite shift in the rhythm of the music of our days this week. With the days shortening, the crops slowing, Leia down to one milking a day, and the need for irrigation dropping, it became clear it was time to reckon up, clean up and face that music. Time to consult The Winter List. This is a scrawled register of all those jobs we intend tackling “when we have more time”. Some items on the list are now redundant as ideas have changed or hurriedly constructed garden beds now literally stand in the way, others are laughably grandiose, but the one thing they all have in common is that they’re hard graft. Over the summer, the green house inevitably becomes the destination for all that stuff that you can’t quite work out a home for. As a general rule, items turfed from the house end up kicking around in the garage until The Bean Counter can stand it no longer, whereupon anything not deemed recyclable, upcyclable or resalable end up in a “we’ll borrow Pop’s trailer” pile. Thus follows the foraging in which the remaining five Homesteaders reduce this mound into enough to half fill the red kerbside collection bin, negating the need to hassle Pop, and a plethora of items not immediately re or up cyclable that “may come in handy one day”*. 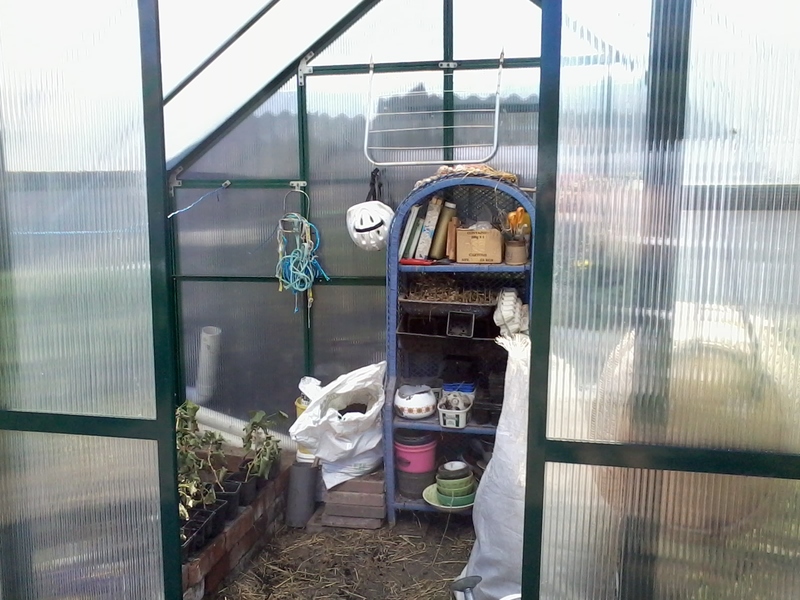 It is these items, guaranteed to up The Bean Counter’s blood pressure should he clap eyes on them, that are consigned to the 2 x 2 metre greenhouse. Top of The Winter List: clean out the greenhouse. Yes, this is it clean. It took the Milk Maid all of Tuesday, and there is a tiny, teeny, almost non-existent (truly) stash of goodies* in a very dark corner of the garage, but that’s one job off the list. Next up: harvest the potatoes. All summer we have rubbed our hands in glee at the healthy, flower bedecked foliage and imagined the sack loads of spud-bounty beneath. Down-heartened doesn’t go close to describing the mood of the two harvesters at lunchtime on Wednesday. An entire morning spent scrabbling through the potato bed for near naught, however the finely tilled soil is easy on the eye after the out of control, tangly mess of insect-nibbled potato tops. See! Every cloud, as they say, has a silver lining. That afternoon, the blackcurrant hedge was pruned and weeded and the redundant support fence was removed. The hedge is sturdy and individual plants have buds aplenty. Slowly but surely the overblown, woody, late summer garden look is giving way to the neat, sparse, well organised winter garden. 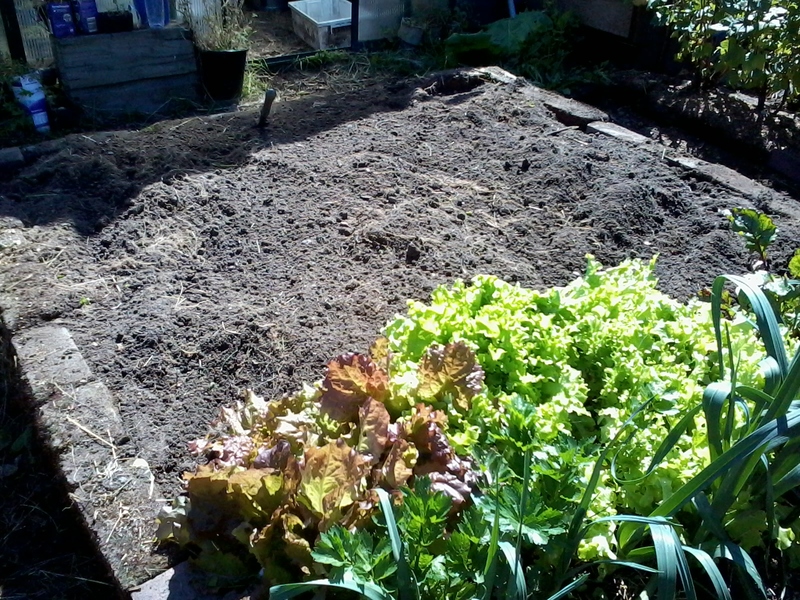 Not that our garden is well organised for a second…but it LOOKS like it could be. 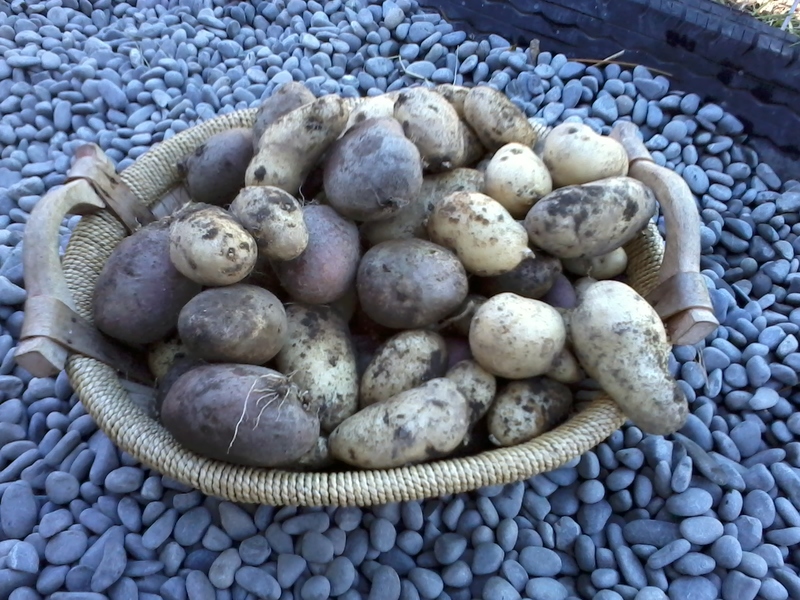 Thursday was spent harvesting and preserving, the perfect counterpoint to Wednesday’s dismal potato harvest. Throughout the winter we will be able to enjoy the utterly unexpected bounty of the straggly gherkin plants we rammed into the marginal dirt of the hurriedly constructed garden-on-the-front-lawn. Talk about punching above your weight! The massive, healthy pumpkins from plants that decided where they wanted to grow have been hardened off and are tucked away (with The Bean Counter’s consent) in the garage. There’s nothing like a peppery pumpkin soup and homemade bread on a dismal August day. We’ve discovered that Kamo Kamo, squash and over blown zucchini boiled and pushed through a fine sieve make the most decadently smooth base for curries, pasta sauces, stews and casseroles. Try it! Perfect to help eek out the tomato yield that has to be shared, here anyway, between those aforementioned dishes and good old tom sauce. The total unsung hero of our garden, however, has been the plant we discovered last year, New Zealand Spinach. It thrives with the minimum of attention, looks gorgeously lush, fills the gaps that the weeds would otherwise occupy and gives, gives, gives. We could eat Palak Paneer every day for a week and still not put a sizable dent into it! Over the winter there’ll be lots of pasta, pulses and rice on the menu, with homegrown spuds for special occasions; we’ll start over again with the potato dream next spring. The preserved, stored, unexpected bonus vege (referred to as “Opa’s plants” as we suspect he gives us a rather frustrated, helping hand at times) will be a tasty reminder of the season just ending. 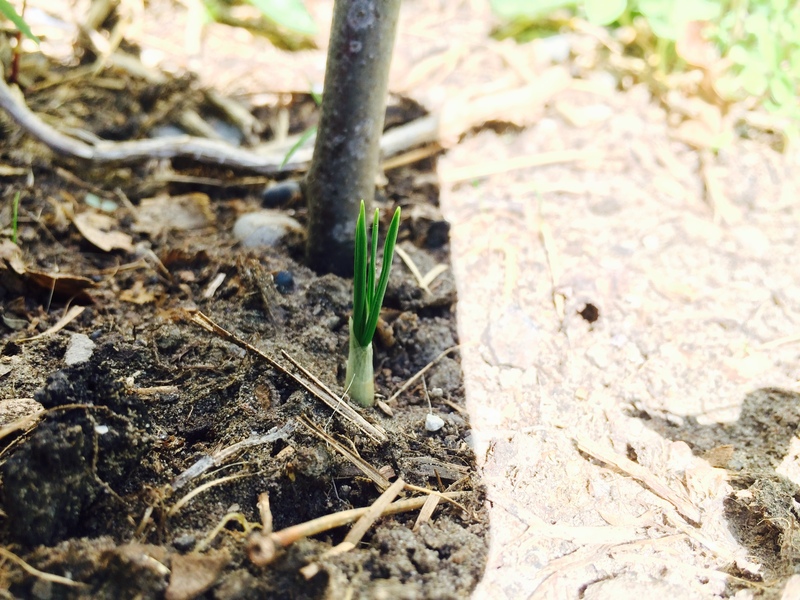 There’s also promise of another season’s harvest as the saffron plants poked their tips through this week. Living like this is “You Win Some, You Lose Some” turbo-boosted, and every day’s a school day. 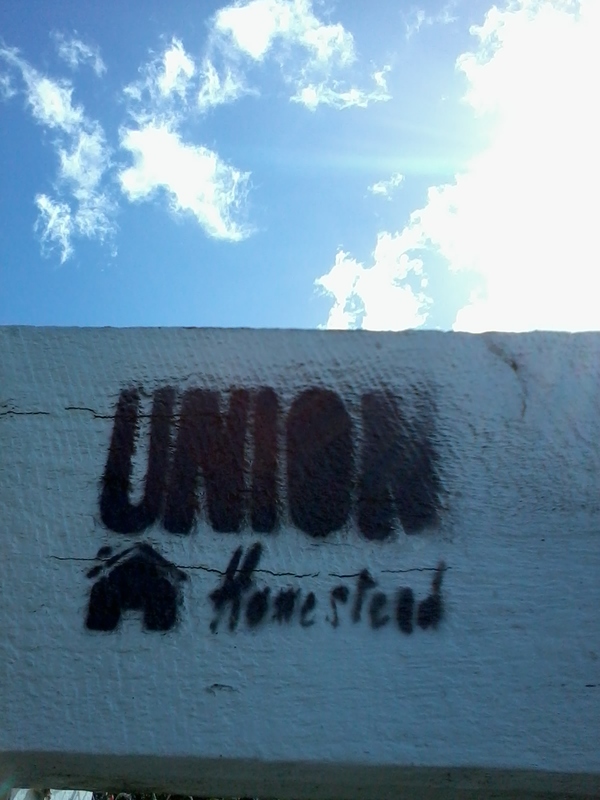 This entry was posted in Family, Union Homestead and tagged Aotearoa, autumn, bad harvest, changing of the seasons, chores, Christchurch, Cleaning, farm, gardening, gherkins, homesteading, lifestyle block, Lists, market gardening, New Zealand, Otautahi, potato, potato harvest, saffron, small holding, spring clean, summer, urban farm, winter. Bookmark the permalink.